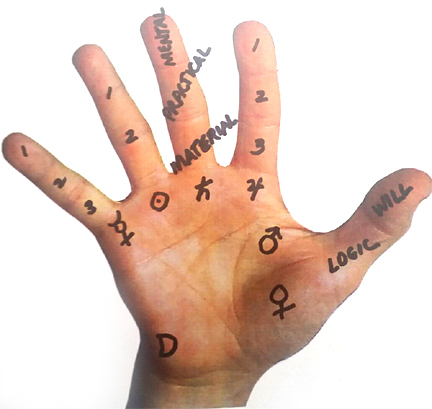 Traditional palmistry identifies seven basic archetypes based on seven planetary places in the hands. Even the newest palmistry books promulgate traditional methods and impart obsolete knowledge derived from centuries of unoriginal thinking. Palmistry and astrology need each other. Astrology establishes twelve basic archetypes based on combinations of four elements and three modalities. Palmistry has embraced the four elements, but has ignored the three modalities. Learning to judge modalities in hands is challenging, but absolutely necessary. The devil is in the details and there are many levels of details. No matter what your archetype and lines say about you, modality modifies interpretation. Knowing a modality is fundamental to knowing a person. If your hands are hard and fingers are stiff, you’ll fight change with every molecule in your psyche. Getting started and letting go will be major life challenges. People whose hands are soft and fingers are very supple and flexible are challenged to be disciplined, structured, and focused. Major life issues include avoiding distraction and saying ‘No’. Mutable types must be more patient and persistent in order to build strong structures on solid foundations that support greater purpose and meaning. Modalities separate traditional palmistry from modern palmistry. I discussed the four elements in a previous blog post. Multiplying four elements by three modalities gives twelve unique character types. Anyone who knows astrology agrees that sun signs are distinctly different from one another. 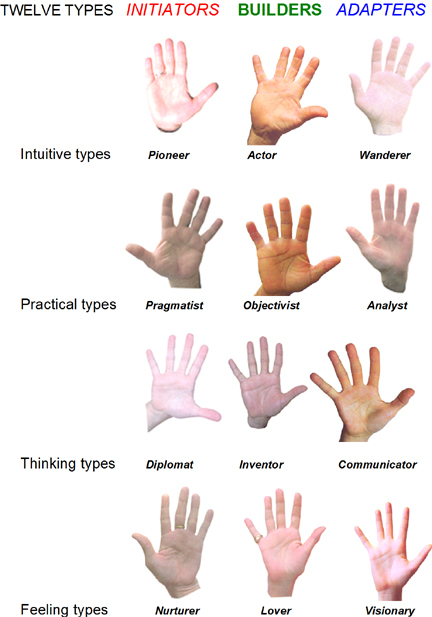 Palmistry represents the same twelve types and shares the same mythology. The greatest challenge is seeing the modalities and judging the degrees to which they’re affecting the elements. That takes practice. Here’s a brief generalized description of how to see the three modalities in the hands. Cardinal signs are Aries, Cancer, Libra, and Capricorn. Solstices and equinoxes are changes of seasons. Aries (spring), Libra (fall), Cancer (summer), and Capricorn (winter) are new beginnings. Cardinal types have boundless energy and enthusiasm when they’re feeling inspired and passionate. Powerful ambition blends with magnetic natures to impel action and achieve goals. They’re best at starting things and not so good at finishing them. When the work becomes mundane or routine, impatience, intolerance, and impulsiveness is imminent. Mid-seasons embody fixity. Taurus (mid-spring), Leo (mid-summer), Scorpio (mid-fall), and Aquarius (mid-winter) are fixed signs. Fixed types maintain, support, and nourish what exists. They’re logical and practical. You can depend on them. They say what they do and do what they say. Their greatest challenge is to see the proverbial handwriting on the wall and then accept and embrace change. They have firm honest handshakes. Their hands and fingers are stiffer than cardinal and mutable types. Large stiff thumbs embody abundant will, supported by dogged determination, and sustained by relentless persistence. Square shape fingertips and developed second knots represent an organized, practical, responsible, reliable, and dependable nature. Cautious types hold fingers closely together and are better team players. Fixed head and life lines are often intertwined at their beginnings. 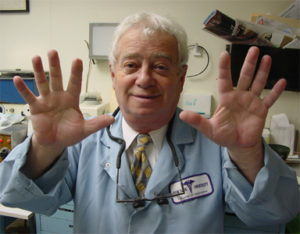 I’ve observed multiple arch finger prints on fixed hands. Procrastination can be a substantial problem. Dr. Bryks is my dentist. He’s a great craftsman and a compassionate, competent, and caring person with a huge ball of thumb. Full ball of thumb people are givers and lovers of home, food, comfort, nature, children, beauty, and art. It’s hard for them to say “No”. Dr. Bryks appreciates everyone. He hums his favorite melodies as he mines for decay in my teeth. If someone has to dig around in my mouth, I’m glad it’s Dr. Bryks. Gemini (late-spring), Virgo (late-summer), Sagittarius (late-fall), and Pisces (late-winter) are mutable signs. They represent changeability. Mutable types generally have warm handshakes that convey honesty and sincerity (which may not be the whole truth). They’re clever, hate conflict, and work hard to avoid confrontation while employing the fine art of tact and diplomacy. 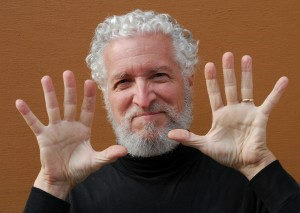 Mutable types have the most openly held, flexible, and elastic hands and fingers of all three modalities. My open hands and strong straight pinkies are saying I have nothing to hide (although I hold many others’ secrets). Cardinal types create, fixed types maintain, and mutable types communicate. Mutable does what cardinal and fixed don’t do or don’t want to do. As a mutable type, I love language and words. Anyone reading my blog knows I’ve chosen to speak for one of the most esoteric and obscure subjects on the planet. 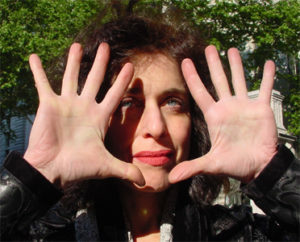 I hope to shift the false paradigm of palmistry as a gypsy fortune-telling scam (before I kick the impending bucket). As an expert on hands and a clear communicator, my mission is to give everyone a helping hand, their own. Priceless treasure waits to be discovered at the ends of our arms. This entry was posted in Aquarius, Aries, Astrology, Cancer, Capricorn, character, feeling, fingers, Gemini, Hand Analysis, Hand Reading, health, intuition, Leo, Libra, Metaphysics, Mythology, Palmistry, Philosophy, Pisces, practicality, Psychology, Sagittarius, Scorpio, Secrets, Self-help, spirituality, Taurus, Virgo, will power and tagged Aquarius, Aries, astrology, Cancer, Capricorn, character, feeling, Gemini, hand analysis, hand reading, intuition, Leo, Libra, metaphysics, mythology, palmistry, philosophy, Pisces, practicality, psychology, Sagittarius, Scorpio, self-help, spirituality, Taurus, thinking, Virgo, will power by markseltman. Bookmark the permalink. I think early on you were a patient of mine. Do you remember that experience? You betcha. You were great! You gave with total love and generosity. Thank you from all of us! I’ll be 69 this month. I’ll bet I still have some of the fillings you put in. I have a question regarding your idea of palm and finger combination and the classification you have made based on the combinations . Is it that idea of rectangular being more emotional types comes due to the fact they have a large subconscious zone. If that is true then don’t you think intuitive and feeling should get along well when the detail part is ignored. Also don’t you think the emotional zones which include the upper mounts need to be considered. Rectangular palms and long fingers belong to feeling types. 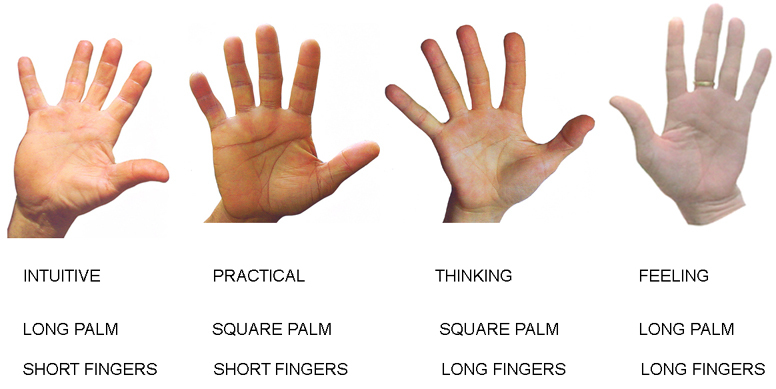 Rectangular palms and short fingers are intuitive types. Long fingered types are more patient, deliberate, and detail oriented while short fingered types are more impatient, impulsive, and conceptual. I’m not sure you can generalize about getting along without seeing the entire picture which includes everything else about the hands and a dialogue with the individuals. I’ve seen fire and water types produce steam and others who produce locomotion. Very interesting! As a triple Cancerian, I seem to combine feeling, practicality, and thinking first. On the chart of hand types, mine looks most like the Inventor. Enjoyed the Flash Rosenberg animation for Leher’s book, which I have. De-mystifying creativity is a great idea, and alerting the uninitiated to that phase of “frustration”– I’d call it “uncertainty”– will surely help them, assuming they’re curious! Also add that it isn’t just the brain, but the spine and whole body that’s involved in creativity. I agree with you on long fingers bring detailed and patient. I have also seen it. My doubt was because Rectangular type subconscious zone is larger is what makes them more emotional or more feeling type. I do know empathy line and mounts need to be considered but I was trying to find a deeper structure for your categories.